Spring is here and we are hosting the Margaret River book club ladies “The Lit Wits”. They are enjoying wine, nougat and some deep discussions about their latest book. The day started with a lovely spring sparkling spritzer. Recipe to come later… Followed by Miki’s Open Kitchen inspired steamed miso fish parcel, then a pork & chicken terrine with a beetroot & hazelnut salad. Now if that hadn’t already excited you, the dessert is still to come. We wanted to show the versatility of our products and how they can be used to compliment one another. 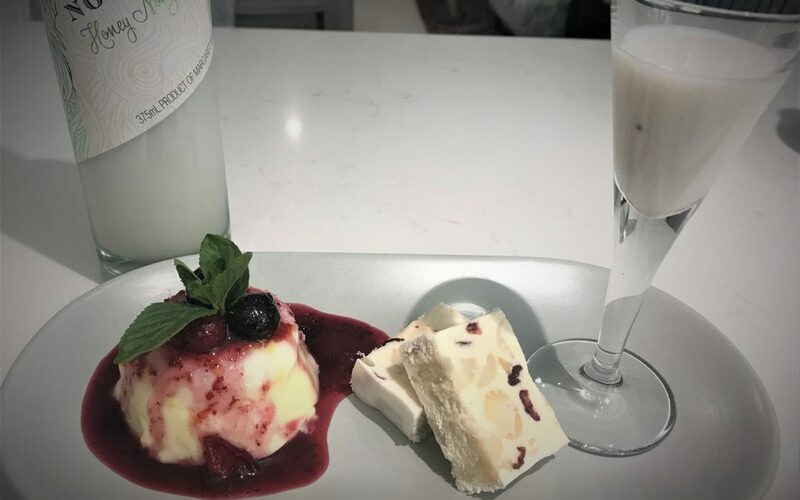 How do you use wine, nougat & liqueur to make a dessert? Pana cotta’s are predominantly vanilla, milk, cream & sugar. Which gave me the idea to exchange a few components and add our nougaretto. Wow it was delicious. 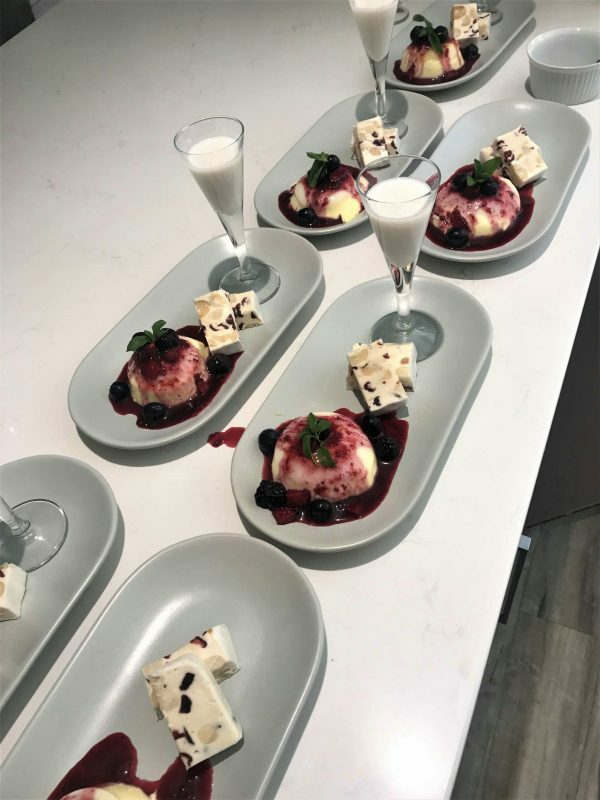 I absolutely love berry coulis with my desserts, they give it a sweet and tart flavor, adding a little bit of quality red wine it makes it out of this world. To tie these components all together we added a side of nougat and a shot of liqueur. Needless to say it was a hit with the ladies! NOUGARETTO PANA COTTA Combine the nougaretto, milk, cream and sugar in a medium saucepan. Place onto the stove and bring to a simmer. Be careful not to allow to boil. Remove from heat and add the gelatine sheets individually ensuring you mix and dissolve each sheet prior to adding a new sheet. Stir until completely dissolved. Transfer to easy pour container. Clingwrap and place to the side to allow to cool. Once you have completed the red wine berry coulis your panna cotta mixture is ready to be transferred into the individual dishes. Pour mixture evenly between the 8 dishes, cover in clingwrap and refrigerate overnight. RED WINE BERRY COULIS Combine the frozen berries, red wine and sugar into a medium saucepan. Place onto the stove and heat until the berries are soft. Using a stick mixer blend until a sauce is created. Cook for a further 5 minutes. Remove from the heat, stir in the butter. Once mixture is cool place in the refrigerator overnight. SERVE Dice the fruit and mix into the berry coulis. Leave some berries in tact to garnish. Remove the panna cotta from the dishes by using a knife to score the edges. Tip upside down onto plate. Pour the berry coulis evenly over the panna cotta. Use the remaining berries and mint to garnish. Slice 2 pieces of nougat per person (approximately 2.5cm per piece). Serve with a shot of nougaretto. Enjoy!